I always consider Honey Nut Cheerios a classic take on the Cheerios brand, and a favorite in our household. What this Medley Crunch seems like is really more of a texture change than a big taste change, but I could be wrong. We will have to make sure we get a box and confirm this, but it looks like it is a mix of two different types of cereals to bring the texture change. I always thought cereal companies should produce limited runs of cereal mixes, where you have two different types of cereals in one box and it seems that Medley Crunch could be an attempt at that. The problem is that Honey Nut Cheerios are so good because they are a simple cereal with a great taste and this “Medley” may wreck that simplicity. My guess is from the kids angle this will not be as big of a hit as Honey Nut Cheerios, but adults may find the new texture a way to break up the cereal monotony. Bought a box today. Like you said, flavor wise, it tastes no different than regular old honey nut Cheerios. But the texture, as you said, is what made me love it. I have always loved the flavor of honey nut, but the texture of cereals such as honey bunches of oats. This provides the best of both worlds. Agreed the texture does remind me of honey bunches of oats. I love it!!! 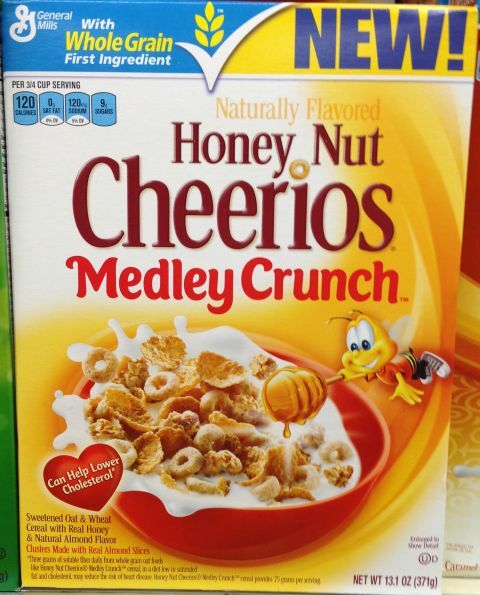 It have the same great honey nut cheerio taste with a wonderful texture to it and a hint of cinnamon!!!! My two favorite cereals are Honey Nut Cheerios and Honey Bunches of Oats with Almonds. Never thought of trying them together but that’s what the Medley Crunch is like and it is now BY FAR my favorite cereal. I LOVE IT!!!!! Trying to find it in a larger container than 13.1 oz. I can say honey nut cheerios is my all time favorite but this new cereal they have come out with has topped the chart. It has everything u could ask for in a cereal and its really crunchy! I think this is my all time new favorite cereal. I added raisins to it. Very tasty stuff. I am in love with this cereal! Combined two of my favorites in one box!